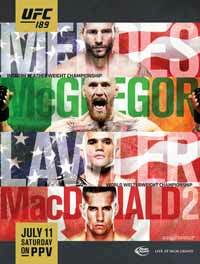 Review by AllTheBestFights.com: 2015-07-11, Matt Brown vs Tim Means gets three stars only thanks to a good finish. Matt Brown entered this fight with a mma record of 19-13-0 (89% finishing rate) and he is ranked as the No.11 welterweight in the world but he comes off two consecutive defeats: against Robbie Lawler (=Lawler vs Brown) and Johny Hendricks (=Hendricks vs Brown). His opponent, Tim Means, has an official record of 24-6-1 (83% finishing rate) and he entered as the No.21 in the same weight class. He lost to Neil Magny in 2014 (=Means vs Magny) but then he has won four consecutive fights beating George Sullivan in his last one. Brown vs Means is on the undercard of Chad Mendes vs Conor McGregor – UFC 189. Watch the video and rate this fight!